That is the question. This is my first time to grow broccoli and two of the plants have developed heads. Although the heads are small, I have a feeling I need to pick them soon (like today) or they will bolt (bloom) and not be any good. My understanding is that high temperatures cause broccoli to bolt and the temperatures are expected to be close to 90 degrees this weekend. This is Premium Crop broccoli and it is about 3 inches across. Some of the flowers look like they are beginning to swell. 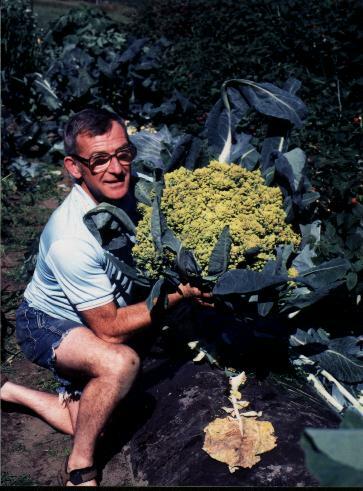 This is Romanesco broccoli. I am not familiar with this variety and was not expecting this when I purchased the transplant. I think the purple tinged flowers are probably getting ready to open. The head is about 4 inches across. Nowhere near the size of this one. If there are any broccoli experts out there, I welcome your advice. Around in the front yard, I saw something I have never seen before. Cedar Waxwings appeared to be eating something off of the bark of my neighbor's pecan tree. Now that they have eaten all of the berries in the neighborhood, they may be getting hungry. I am not sure if the were eating lichens, insects or the flowers that the rest of the flock was releasing from the canopy of the tree. I wish they would have been still long enough for me to get better pictures. If I can get my thoughts together, I plan to have a post tomorrow that may leave many shaking their heads in disbelief. My prairie goes through seasonal color changes as plants come in and out of bloom. The cycle makes for an ever changing kaleidoscope of colors. The dominant color right now is yellow. The bright yellow flowers of Four Nerve Daisy, Tetraneuris scaposa, continue to fill the front prairie. Their flowers are held high above the foliage. Also in bloom is Salvia greggii. Near the Salvia is one of the first Bluebonnets, Lupinus texensis, to bloom this season. Golden Groundsel, Packera obovata, is a woodland groundcover that blooms in late winter/early spring. This patch grows at the base of a Possumhaw Holly, Ilex decidua, and receives full sun. Another patch under a red oak tree has more competition from other plants and is not as vigorous. Here is a close up of the flowers. When the flowers dry and go to seed, they will look similar to little dandelions. New plants start from the roots. As far as I know, I have not had any new plants grow from seeds. The flowers of Stemless Evening Primrose, Oenothera triloba, open in the evening. Their buttery yellow flowers dot the backyard prairie. This is an annual flower that reseeds readily. I removed a few plants this year because they were so dense and I was concerned that they would inhibit the growth of other plants. There are fewer of the spicy scented Buffalo Currant, Ribes aureum, flowers this year. Last year, the four feet tall and wide shrub died to the ground due to the drought. A few suckers are all that survived. Large flocks of Cedar Waxwings, with their yellow bellies and yellow tipped tail, are still flying around the prairie. They are eating every last berry off of all of the trees and shrubs in the neighborhood and will move on once their food supply is exhausted. This one is resting between meals in my Redbud tree, Cercis canadensis, while the rest of the flock hangs out in surrounding trees. This photo was taken through a window and was the best I could get. The oak trees are beginning their annual ritual of dusting everything in sight with a greenish yellow layer of pollen. I feel a sneeze coming on. The vast majority of the plants in my prairie garden are native to Texas. Moreover, the native plants in my garden were selected because they benefit the suburban wildlife populations of insects, including bees and butterflies, birds, and reptiles by providing food and shelter. So why am I growing these six inch "Tete-a-Tete" daffodils that do not benefit wildlife whatsoever? I grow them just because I think they are cute. There, I said it. I think these little daffodils are cute. They do absolutely nothing for the wildlife, but for the week and a half that they bloom each spring, they brighten my days and make me smile. And if they happen to brighten the day of a passerby or visitor to my garden, then maybe they do benefit wildlife after all because people can be pretty wild at times too. By the way, after 39 months, this is post #100 of the Plano Prairie Garden blog.